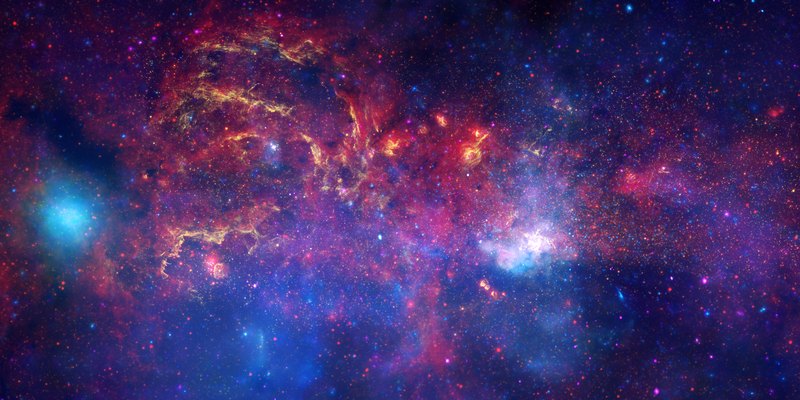 A new image of the center of the Milky Way combines data from NASA's three Great Observatories. In this image, X-rays from Chandra are blue and violet, near-infrared emission from Hubble is yellow, and Spitzer's infrared data are red. Large prints of this image were distributed to some 150 U.S. planetariums, science centers and others as part of the International Year of Astronomy 2009 activities. In celebration of the International Year of Astronomy 2009, NASA's Great Observatories — the Hubble Space Telescope, the Spitzer Space Telescope, and the Chandra X-ray Observatory — have collaborated to produce an unprecedented image of the central region of our Milky Way galaxy. In this spectacular image, observations using infrared light and X-ray light see through the obscuring dust and reveal the intense activity near the galactic core. Note that the center of the galaxy is located within the bright white region to the right of and just below the middle of the image (labeled Sagitarrius A when you roll your mouse over the above composite image). The entire image width covers about one-half a degree, about the same angular width as the full moon. Yellow represents the near-infrared observations of Hubble. They outline the energetic regions where stars are being born as well as reveal hundreds of thousands of stars. Red represents the infrared observations of Spitzer. The radiation and winds from stars create glowing dust clouds that exhibit complex structures from compact, spherical globules to long, stringy filaments. Blue and violet represents the X-ray observations of Chandra. X-rays are emitted by gas heated to millions of degrees by stellar explosions and by outflows from the supermassive black hole in the galaxy's center. The bright blue blob on the left side of the full field image is emission from a double star system containing either a neutron star or a black hole. Coordinates (J2000) RA 17h 45m 36s | Dec -28° 55´ 58.8"
Universal mean Beyond your inspiration. Absolutely amazing. No way we are alone. No person in their right mind would want to get close to the 4 million solar mass black hole at the center of our Milky Way galaxy, except for some Cosmologists who think they can go through the "singularity" and come out on the other side somewhere else in the Universe. Good luck fellas, you're gonna need it! It is really wonderful. And I am very happy with this achievement of NASA. I want to know how the space looks in 3d. It appears to me as if the X-ray portion of the image shows a faint jet coming up from Sagittarius A. Of course, it could be just other hot excited gases that's not associated with Sagittarius A. I don't know if further analysis has been done to determine one way or the other. Would a lack of radio jet emission be considered enough to rule out such a possibility? Could it still be a remnant of a jet in the not too distant past? It looks like the center of the milky way is very light. If you lived on a planet in the middle of the milky way, would there ever be night darkness? Careful analysis of radio and infrared images has taught us where the center of the galaxy is. We won't ever know what's happening now, because of the light travel time. But, it's interesting that the further out we look, the more we can see into the Universe's past. Unfortunately, UV images don't probe the area close to the center of the galaxy because of very strong absorption by gas and dust. That's an interesting idea. The detail is fine, but it's not that fine. Thanks. There isn't evidence in these images for jets generated by the black hole. It appears to be too inactive for such jets to appear, unlike the case for some large black holes in other galaxies. Hi, How do we know the center of the galaxy is in Sagitarius and not say in Gemini constelation direction? Amazing, you folks are doing a great job to humanity. One question - if this is what it looked like so many light years ago, how do we know what's happening now? This is an awesome picture. I've seen the infrared galaxy core pic before, but I've never seen the x-ray infrared and visible all combined. There should be a picture of the core in ultraviolet to add to this also. What a wonderful. And I guess, If this is only the center of the milky way and our planet is more little, What a little we are in this universe. A wonderful composite image. The detail is very fine. I wonder if it is possible to detect the disturbance in dust and gas, made of objects passing through them? The stars visible in the galactic center image are moving in various orbits around the supermassive black hole. In terms of galactic motion the black hole is effectively stationary, while out here in the solar system - in the galaxy suburbs - we're swinging around the center of the galaxy as the arms rotate. Absolutely outstanding pictures, thank you so much for allowing me to see. WOW. I'm sorry, no other words describe it. Thanks so much to the Chandra team for their hard work to educate us lay people about our most marvelous universe. love the pic, awesome, my guess it's moving clockwise as viewed from above we are on the side view obviously, upward and away from us. Just a guess based on her structure. Wonderful image. Can we distinguish the gas jets streams from the black hole at the center? If you could produce a three dimensional version of this portion of space how would it look? In a three dimensional box which way is the black hole moving through space? A view of the turbulent heart of our Milky Way galaxy. By combining X-ray data from Chandra with near-infrared data from Hubble and infrared data from Spitzer. The entire image width covers about one-half a degree, about the same angular width as the full moon. Blue and violet represents the X-ray observations, yellow represents the near-infrared, and red represents the infrared.